Posting to learn how to use photobucket again. 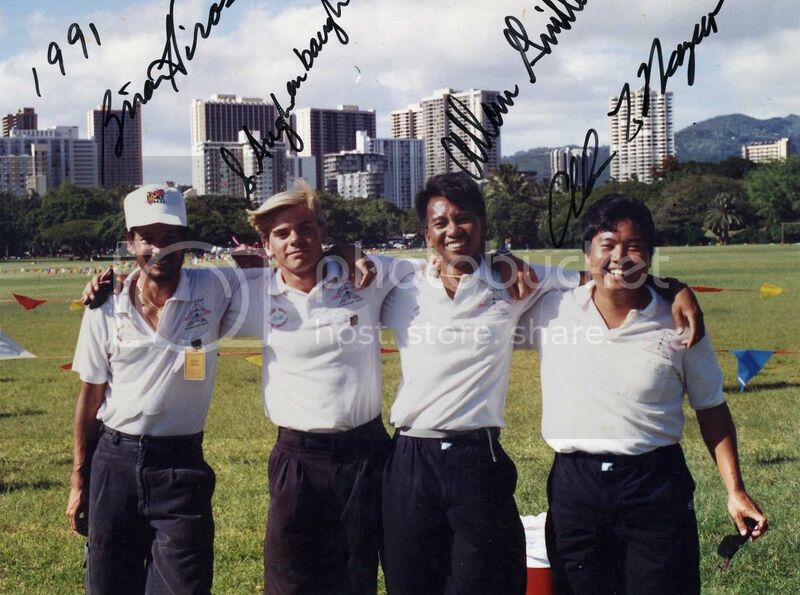 Looks like this pic was taken during the 91 Hawaii Challenge International Sportskite Championship at Kapiolani Park in Waikiki, I was there that weekend. Bought some of my kite from them when they had a kite shop at Ala Moana Center. I haven't seen any of them in years. Brian Hirose, Allen Guillen, and Alan Nagao don't fly anymore these days as I haven't seen them out at the usual flying spots in years. Scotty Augenbaugh still flys regularly these days, the team was always out at Sandy Beach on Saturdays and Sundays with kites and teaching people how to fly them. Since their shop closed years ago, they are no longer there. I used to fly at Kapiolani park in 87 and 88. Its where I was first introduced to kites. The guy that owned the kite shop across the street is where I bought my first kite. He is also the one who let me fly a Hawaiian for the first time. I honestly dont remember what he looks like, he could be in the pic. Great memories flying there!! Thanks for the time travel moment. Worked with him a bit years ago, would like to reconnect as I will be out there first week of June. IRT Coop above post- You are referring to Robert Loera (not in pic), who ran his Kite Fantasy shop out of the hotel across the street with his wife Barbara. I think Alan N (in the pic) also worked there until he opened his own shop, High Performance Kites...which resulted in a rivalry between the 2. Robert's late brother Raymond, once helped me fly late into the evening, wind dying, by loaning me extra lines and showing me how to splice them to mine, so the kite was well above the trees that surround the park. Robert Loera also started the Hawaii Kite Challenge in the early 80's, and soon the top American teams -TOL, (THP among them), other teams with some current and many former members of this forum, teams from Japan, Australia and Europe were competing in Hawaii at the annual event. Also many well known individual fliers like Ray Bethell, a then young John B, and famous single line kiters. Sadly, the Hawaii kite Challenge in 1998 was dedicated to Raymond who had passed away while in his 30's. Robert and Barbara moved to Maui in the early 2000's and opened a toy store in a mall in Lahaina. It may still be there.